7 days a week, 5 a.m. - 9 p.m. The village of Wanchese has long been a major player in the East's commercial fishing industry, but nearly all the fruit of its fishermen's labor lands elsewhere, whether up the road in Manteo, across the sound on the Outer Banks or out-of-state entirely. Just a fraction of the seafood caught by the fishermen of Wanchese Harbor stays in Wanchese Harbor. It's steered into Wanchese Marina, unloaded onto the dock and welcomed into the renowned steam bar at The Landing Grill for preparation. This is where you come in. If you’re visiting, it’s probably a mission of yours to experience fresh Outer Banks seafood to the fullest. Well, it doesn’t get any more fresh than this — and there's no doubt you’ll leave full! Easily the up-and-coming restaurant on Roanoke Island, The Landing Grill encapsulates the casual pace and old-world charm of Wanchese. Come that inevitable day when you want a break from the bustle of the beach, Wanchese is where to go and The Landing Grill is where to eat. Set quaintly waterside at Wanchese Marina, we offer a well-rounded menu highlighted by intensely fresh, local seafood and punctuated by astonishingly good pizza. Crave neither in particular? Try both combined! Our gourmet seafood pizza has soared in popularity. We even offer free pizza delivery to all of Roanoke Island. The restaurant is certainly not just for watermen, but boy, is it for watermen! Pull your boat into a slip and pop onto the dock to recharge. Our entire menu is available to go, so no worries if you don’t have the time to dine-in for lunch or dinner. Maybe it’s simply a snack or cold drink you’re after — you’ll find those convenience items here too. 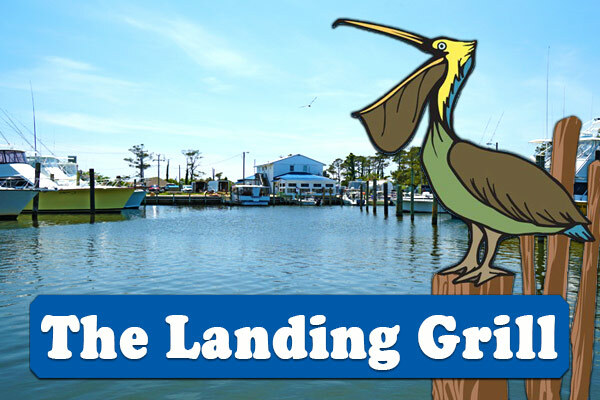 The Landing Grill waterfront restaurant on Roanoke Island is the chief amenity at Wanchese Marina. It might be one of our many charter fishing excursions that lead you here. Lucky you found us! At no other marina can you enjoy a hearty breakfast before you set out on your trip. We start serving at 5 a.m. daily. This is a taste of life on the high seas. Two dining areas; one up front complete with window-facing bar seats and 2 TVs, and one in back offering a steam bar and water views. In between, find convenience items like ice cream, packaged snacks and drinks, as well as t-shirts, hats, sunglasses and sunscreen.